Meadowlark Lemon was a greatly admired basketball player, actor and Christian minister. He was also known for the more than 20 years he spent touring with the Harlem Globetrotters team. St. Vincent de Paul was blessed to have him spend some time at our downtown Phoenix Henry Unger Dining Room, encouraging guests and sharing an inspiring message of hope for our Never Give Up program. After learning of his recent passing at the age of 83 (Dec. 27, 2015), Steve Zabilski, SVdP executive director, shared a few words in his memory. "We are saddened by the passing of a truly wonderful basketball player and entertainer, and an even better man. 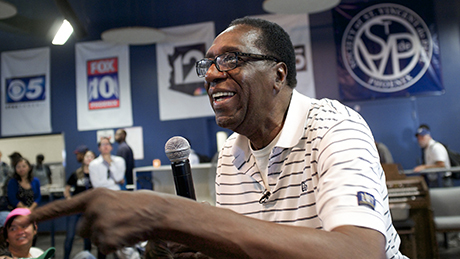 Meadowlark Lemon was the world's ambassador, and he will be greatly missed by the billions of people he made smile and laugh. We were so blessed that Meadowlark was a regular volunteer at St. Vincent de Paul. God bless you, our dear friend."